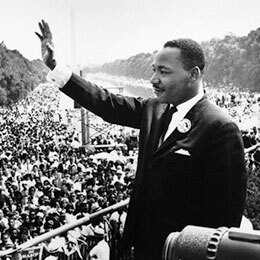 Martin Luther King Jr.’s speech 50 years ago today on Washington D.C.’s National Mall and Memorial Parks has become one of the most famous, and quoted, pieces of oratory in U.S. history (though that wasn’t apparent to everyone at the time). But how well have the aspirations King so memorably expressed been realized? We ran some numbers to try to find out. Poverty rates among African-Americans has fallen considerably since the 1960s, according to Census Bureau figures, but they remain far more likely than whites or Asians to live in poverty. 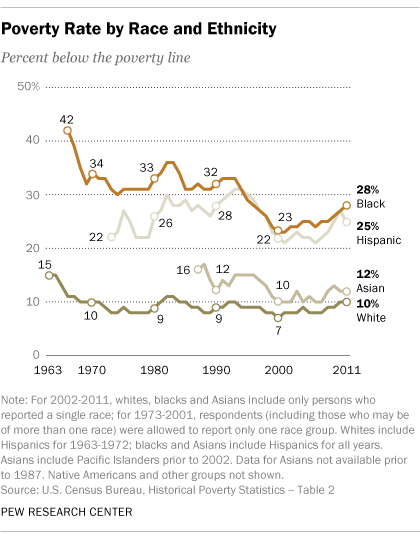 And after years of decline, the black poverty rate has crept higher over the past decade. The 1950s and 1960s were the high point of residential racial segregation in the United States, according to analysis of Census data by Edward Glaeser and Jacob Vigdor of the Manhattan Institute. Though it’s declined steadily since 1970, racial segregation remains more prevalent than, say, segregation by income. 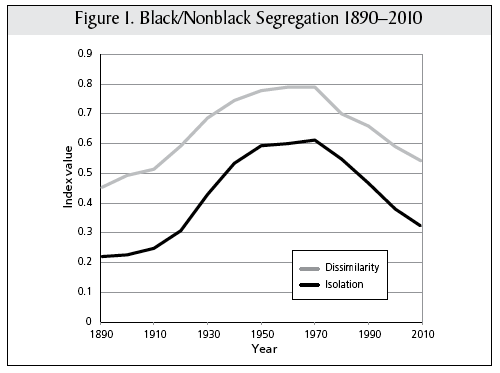 Social scientists use two key metrics to assess residential segregation: dissimilarity and isolation. “Dissimilarity” measures the extent to which two groups — for instance, blacks and whites — are found in equal proportion in all of a city’s census tracts; the number indicates the proportion of individuals of either group that would have to move in order for both to be evenly distributed. “Isolation” describes the racial makeup of the census tract where the typical person of a given race lives; the number indicates the extent to which that race’s share of the “typical” tract’s population exceeds its share of the city’s overall population. In both cases, higher numbers indicate greater segregation. So, around the time King gave his famous speech, the typical urban African-American lived in a city where 80% of the black population would have had to move in order to be evenly distributed with non-blacks, and in a census tract where the black population share exceeded the citywide average by roughly 60 percentage points. Though dissimilarity and isolation both are lower than they’ve been in decades, the typical urban African-American still lives in a metro area where more than half the black population would need to move in order to achieve complete integration, and in a census tract where the black share of the population is roughly 30 percentage points higher than the metropolitan average. The longstanding gap between black and white turnout rates in presidential elections began narrowing in the late 1990s, as the black voting rate rose and the white rate plateaued and then began to fall. 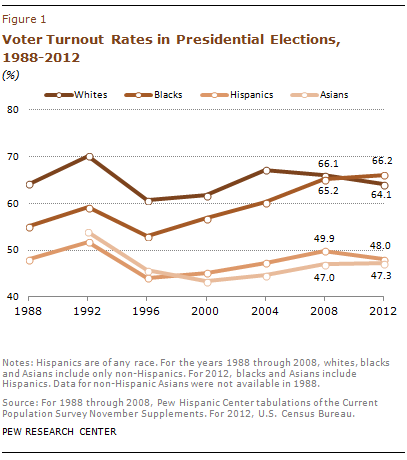 Barack Obama’s candidacy in 2008 and 2012 doubtless contributed to that trend: Last year’s election was the first in which black voter turnout exceeded that of whites. This month’s Pew Research Center report on the state of U.S. race relations found that by and large, most blacks and whites say the two races generally get along well, though whites (81%) are somewhat more likely than blacks (73%) to say so. The survey suggests that overall perceptions of black-white relations haven’t changed since Pew Research last asked the question (in November 2009); about three-quarters of both blacks and whites in that earlier survey said the two races get along very or pretty well. The current Pew Research survey found that majorities of blacks still perceive discrimination from many institutions in their communities, and are consistently more likely than whites to say blacks are treated less fairly than whites. Seven-in-ten blacks said blacks were treated less fairly in dealings with the police, versus 37% of whites who said so; almost as many blacks (68%) said blacks were treated less fairly in the courts. About half (54%) of blacks, versus 16% of whites, said blacks were treated less fairly at the workplace, a share that’s been rising since the late 1990s. And just over half (51%) of blacks, compared with 15% of whites, said their local public schools treated blacks less fairly. On the other hand, blacks were about equally divided as to whether blacks in their communities received equal treatment from stores, restaurants, doctors and hospitals, and at the voting booth.